Insert a light, penetrating oil primer into the joint. The coupler on the end can be replaced and it comes with a 5" flexible hose for getting to those hard to reach fittings. Pocket model is smaller and lighter but works in the same way as the kit model. The smaller diameter piston actually produces 2-1/2 times more pressure than its larger brother. With both of these great tools, you will be able to unclog any joint, every time. 10 _ 1/8_ 27 PTF 45 deg. 10 _ 1/8_ 27 PTF90 deg. 10 _ 1/4_ 28 SAE LT 45 deg. 10 _ 1/4_ 28 SAE LT 90 deg. 5 _ M6 x 1 45 deg. 5 _ M6 x 1 90 deg. 5 _ M8 x 1 45 deg. 5 _ M8 x 1 90 deg. 5 _ M10 x 1 45 deg. 5 _ M10 x 1 90 deg. 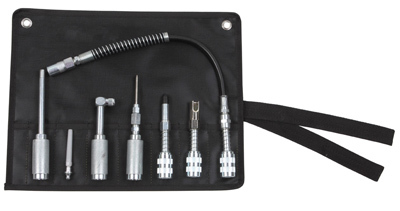 This versatile kit offers a simple and effective system to make all greasing jobs easier. 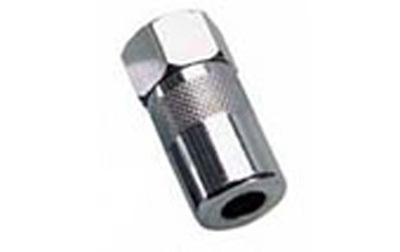 Professional Recessed Lube Adapter with Quick Disconnect _ for pushing on greasing of recessed fittings where obstructions would not permit the use of a regular hydraulic coupler. 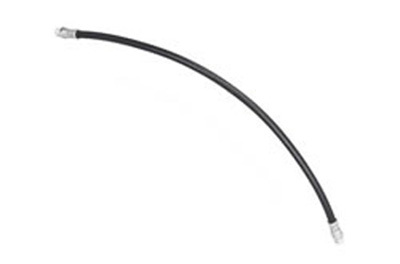 Whip Hose with Heavy-Duty Coupler and Quick Connect _ converts steel extension coupler assembly on grease guns to a flexible hose that allows the grease gun to be used for greasing hard to reach fittings. The grease fitting on the opposite end of the hose snaps conveniently onto all jaw type couplers. 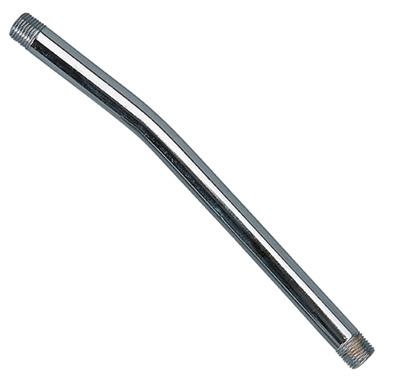 A spring guard fitted on the coupling end provides rigidity that makes the coupling end snap easily onto grease fittings. 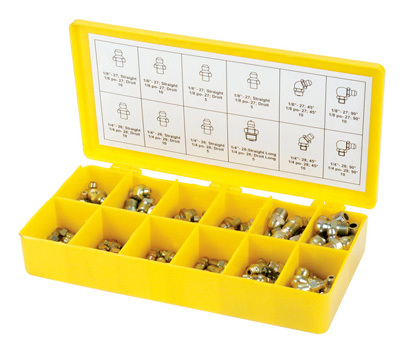 Jaw Type Coupler _ greasing end rubber tipped seal off dispenser with quick disconnect for quickly converting regular couplers for lubricating automobiles with grease plugs, etc. to fit straight onto the grease gun coupler. 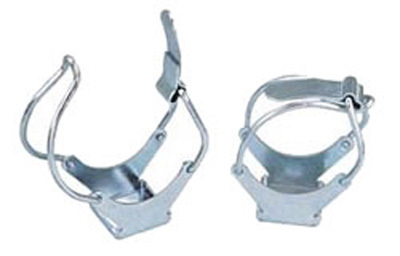 Narrow Needle Nose Adapter _ designed for greasing flush or hard to reach hydraulic type fittings in inaccessible areas. 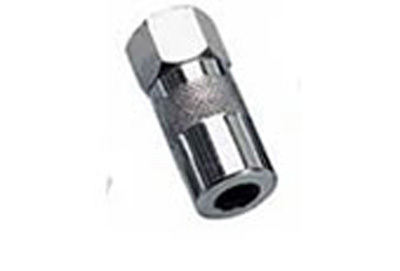 90 degree Angle Adapter/Right Angle Adapter _ for greasing inaccessible grease fittings in shoulders and other confined areas. Regular Coupler to Right Angled Coupler _ right angle coupler fitted onto a quick disconnect adapter. Ideal for quickly converting regular couplers for greasing fittings with limited access in low height areas, etc. to fit straight onto the grease gun coupler. Stainless Steel 1_-in. 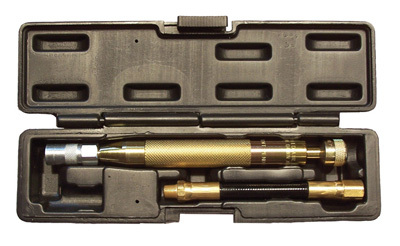 Grease Injector Needle _ lubricates in very tight spaces such as universal joints and sealed bearings; equipped with standard grease fitting without ball check. PN:KMGF44829 Grease Gun Hose, Bent Pipe, 6"
PN:KMGF6231 Grease Gun Hose, High Pressure, 3500 PSI, 12"
Minimum radius bend of 1.57"
Hose ID .14", od .33"
PN:KMGF6232 Grease Gun Hose, High Pressure, 3500 PSI, 18"